﻿ Sesame Chicken Bites - Merwanjee Poonjiajee & Sons Pvt. Ltd.
Wash, dry, trim fat & tendons from chicken. Cut breasts into 1" * 3" strips. Marinate for 30 minutes in a mixture of yogurt & curry. Drain the chicken well & discard marinade. In a separate bowl, combine flour, sesame seeds, garlic, salt & pepper. Heat the oil in a saucepan to 350oC. Fry chicken, in batches, 3 minutes or until cooked thorough and golden. Briefly drain on paper towels. Stir chutney & mustard together. 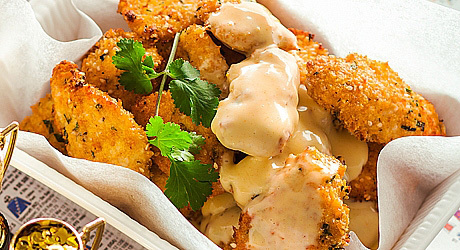 Serve as a dipping sauce with the chicken.